The current US President may be the oldest in a while to lead the nation, he certainly knows what is popular. 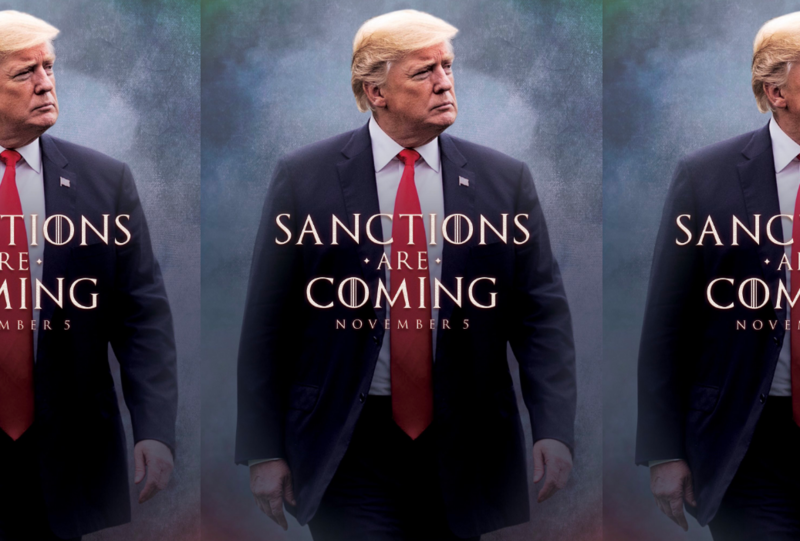 In a year where Game of Thrones fans have to miss out on their favourite pastime as the series is only set to return in 2019, President Trump used an infamous phrase to mercilessly mock the regime of the mullahs in Iran. Although HBO asked POTUS to resist in the future from using imagery from their series, the President’s fans loved it and made the image go viral in no time. With the poster, the White House highlighted that the United States will reimpose tough sanctions on Iran as from this week. More specifically, it will add 700 individuals and entities to its Iran blacklist and pressure the global SWIFT banking network to cut off Tehran when the expanded sanctions are put in place next week, exactly one day before US citizens go to vote in Midterm elections. In a further statement issued Friday night, Trump said, "Our objective is to force the regime into a clear choice: either abandon its destructive behavior or continue down the path toward economic disaster." The sanctions will take effect Monday and cover Iran's shipping, financial and energy sectors. It's the second batch of penalties that the administration has re-imposed since US President Donald Trump withdrew from the landmark 2015 nuclear deal in May. Secretary of State Mr Mike Pompeo explained that the sanctions are "aimed at fundamentally altering the behavior of the Islamic Republic of Iran. Maximum pressure means maximum pressure." "Our ultimate aim,” said Mr Pompeo, “is to compel Iran to permanently abandon its well-documented outlier activities and behave as a normal country." The state department then released a list of 12 demands that Iran must meet if it wants the sanctions lifted. Iran's Foreign Ministry spokesman Bahram Qasemi responded: "America will not be able to carry out any measure against our great and brave nation … We have the knowledge and the capability to manage the country's economic affairs." Last paragraph, a tip off of deep state control? Hmm I dunno Shaggy. what do you think? Another Mystery? Get the gang together. Trump does what he's told.